Two moments merged during my early 20s, impacting my future in ways I had no way of understanding at the time. Now, standing firmly in that future I could not have foreseen, I begin to piece together the way what seem to be separate events were actually part of the mosaic that becomes our lives. By Teresa Cutler-Broyles. Why travel? Why to Italy? A friend handed me a book one day. I felt a tingle as I touched the cover, presaging what would indeed be my reaction as I began reading. For days, for weeks, I pored over the book, immersed in what felt like the answer to a question I hadn’t asked. Joseph Campbell’s The Hero with a Thousand Faces was already almost 40 years old, Campbell was still alive, and the phrase that has become associated with him – ‘Follow your bliss” – had yet to be uttered. But somehow, reading about the Hero’s Journey, learning that Calls to Adventure are everywhere around us, all the time, and that to Refuse the Call is to become “walled in boredom, hard work, or ‘culture,’ … [to lose] the power of significant affirmative action and become[s] a victim to be saved,” opened up the world, and anything became possible. 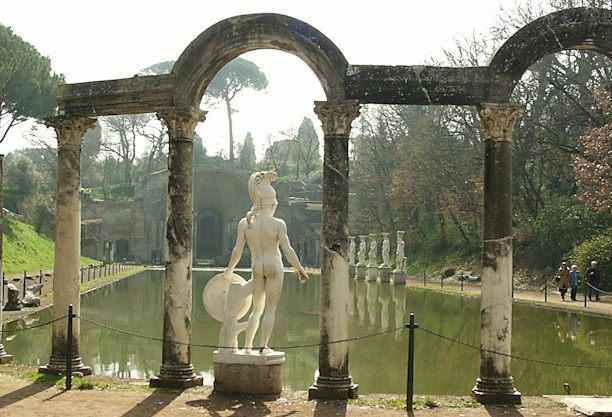 At the time, I was taking a class at Arizona State University about ancient Roman history and became fascinated with a picture of a particular statue in Villa Adriana, the ancient Roman Emperor Hadrian’s country estate in Tivoli, outside Rome. I stared at pictures of this statue, I checked out books at the library to learn more, I practically felt its smooth marble surface under my fingertips. It haunted my dreams, and while I didn’t realize it at the time, it became my Call to Adventure. Fast forward 17 years. I had not followed a traditional path, I had not sought a traditional job. From the outside, I’m sure my life’s journey looked like a knotted ball of twine; in my own heart I knew I’d been true to the ultimate bliss I sought – and yet I felt always in process. I looked around me at people who seemed to have settled into the lives they wanted and was sometimes envious, yet I keyed into the word ‘settled,’ and I kept walking. I kept writing, kept moving forward, kept exchanging one moment for the next, and I was both sure of my journey and curious whether it was all an illusion, and often wondered whether I should stop moving, stop hopping, stop hoping, stop… stop. 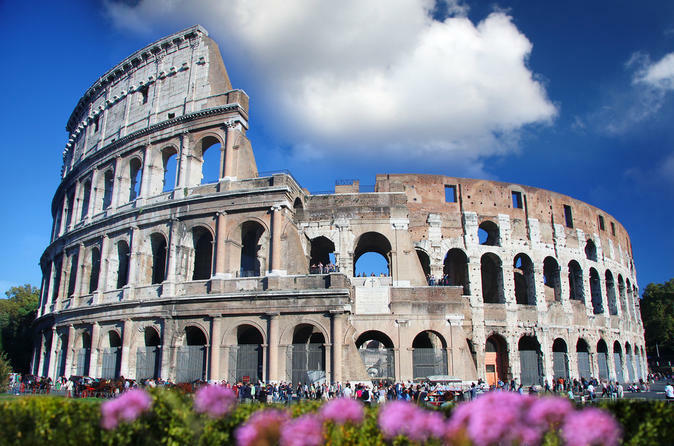 Just before my 40th birthday and without much planning, sensing a pull I did not name, I bought a ticket to Rome and registered for a 4-week language course. I didn’t sleep on the 16-hour journey; I landed exhausted, exhilarated, terrified. I spent a month exploring the tiny alleys, walking in the shadow of the Coliseum and along the Imperial Way, staring in awe at the marble floors and vast spaces of the extraordinary Basilica of St. Peter’s and the smaller but just as beautiful Pantheon. I walked narrow cobblestone streets in Florence and stared at David for an hour, and tread softly through the haunted avenues of Pompeii, seeing ghosts out of the corners of my eye. I filled myself with the exquisiteness that was Rome, past and present. Yet I was still incomplete. Toward the end of my trip, I headed east from Rome in search, finally, of the statue I had held onto as signpost, as siren. Without a map I rode the Metro as far as the train would go. 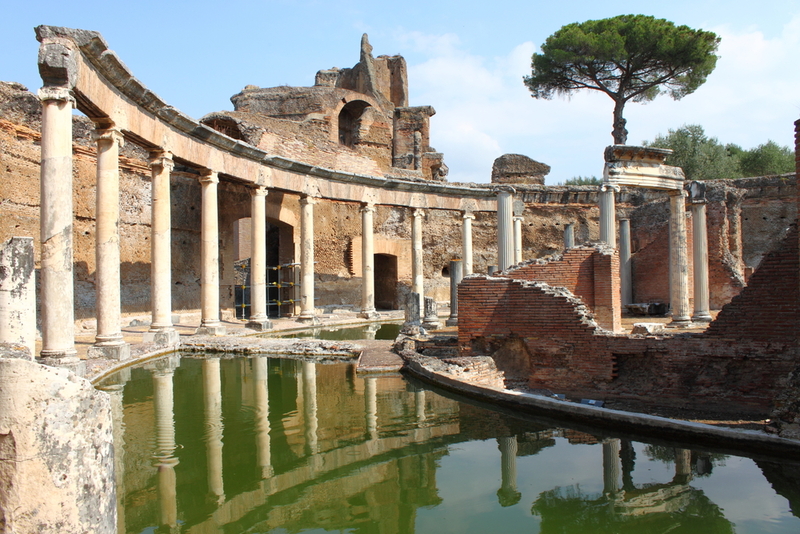 Somehow I boarded the right bus at the station and, with the help of three tiny, ancient Italian women who accosted me as if I were their own granddaughter and who practically pushed me off the bus at the correct stop an hour later, I found myself at the entrance to Villa Adriana. I felt as if I were in a dream. I walked up the hill. I turned left. I had no sense of direction, no sense of time. There were no other people, and no signs to direct me. I literally let my bliss lead me forward. I don’t remember actually seeing anything along the path; it was as if I wore blinders. It was hot. I did not question my footsteps, did not wonder how I knew that statue would be waiting, ahead somewhere. I topped a small rise. And the point to which my Journey had always been moving appeared. The statue, framed in an arch and back-dropped by a pool of water so still it was like a mirror. The scene took my breath away – not for its beauty because, while indeed beautiful, it was just one in an uncountable number of beautiful things I had been inundated with since my arrival. Not for the statue’s uniqueness, for it was in the company of others. Not for its historical import for it was not the original one that had stood there 2000 years before but a reproduction that, while still old, was not the one that had been touched by Hadrian as he would touch a lover’s skin. No, what left me breathless was the realization that this moment had been arrived at through a series of what could be seen as accidents, aimless wanderings through a life, lucky guesses about bus schedules and random encounters with Italian grandmothers… and yet had been inevitable since I first read Joseph Campbell’s book. I don’t remember walking to the statue itself. When I touched its smooth marbled legs and rounded buttocks and sculpted arms, and when I sat, suddenly, in its shadow and stared at the surface of the pool over which it presided, I knew for the first time a feeling that has since visited me many times, and most often in Italy: if I died at this moment, I would be fulfilled. For you see, Campbell was right. Following one’s bliss is the only thing worth doing, the only path worth treading. All else is simply marking time.